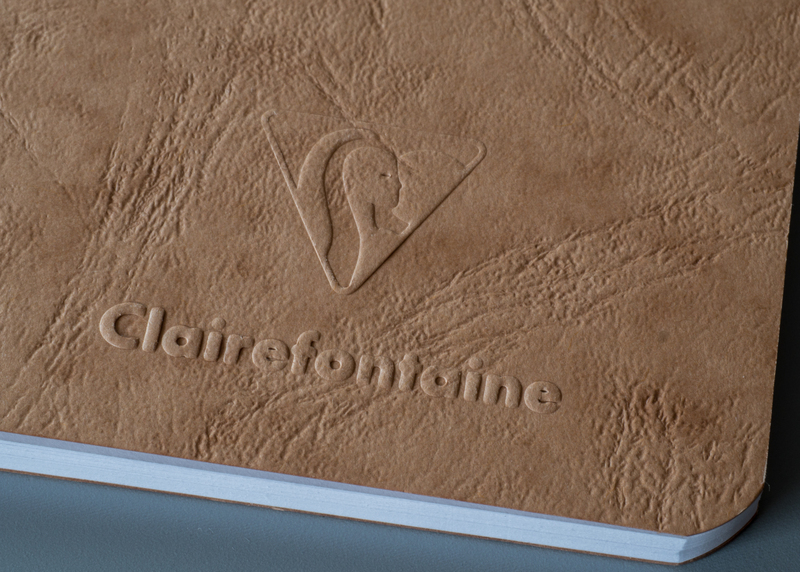 As I set out on my quest for a good two-book Bullet Journal setup, my search for a good softcover notebook started with Clairefontaine. I was very impressed with the paper quality in the A4-sized Clairefontaine Classic Wirebound, and I recalled seeing some softcover A5 notebook options during previous online shopping sessions. I ultimately went with the Clairefontaine Life. Unplugged Staplebound Duo (A5 size) as my first test subject. The "duo" in the name refers to the fact that the books are sold in packs of two. Goulet Pens stocks a tan and black set and a red and green set for $9.50 per set of two. 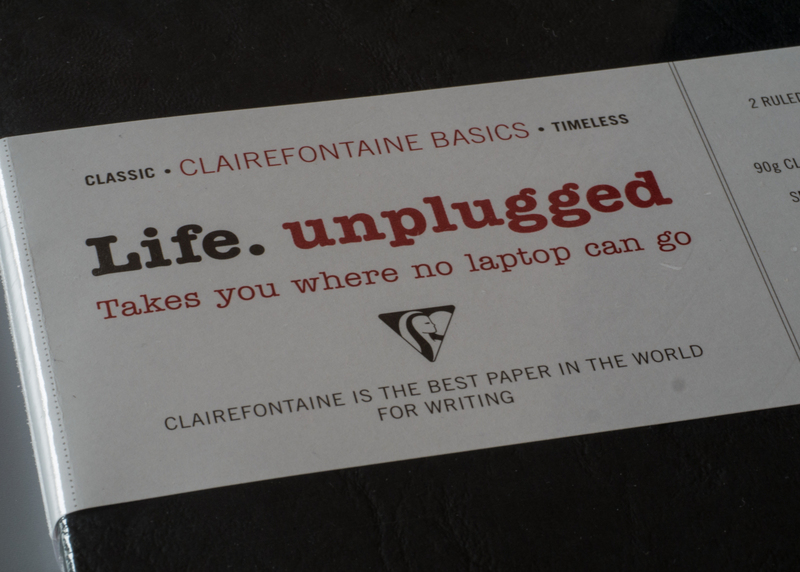 Each book contains 96 pages of 90gsm Clairfontaine paper, and I think it's a great value. The total page count for pair (192 pages) is identical to the page count in my current hardcover Bullet Journal of choice, the Baron Fig Confidant. 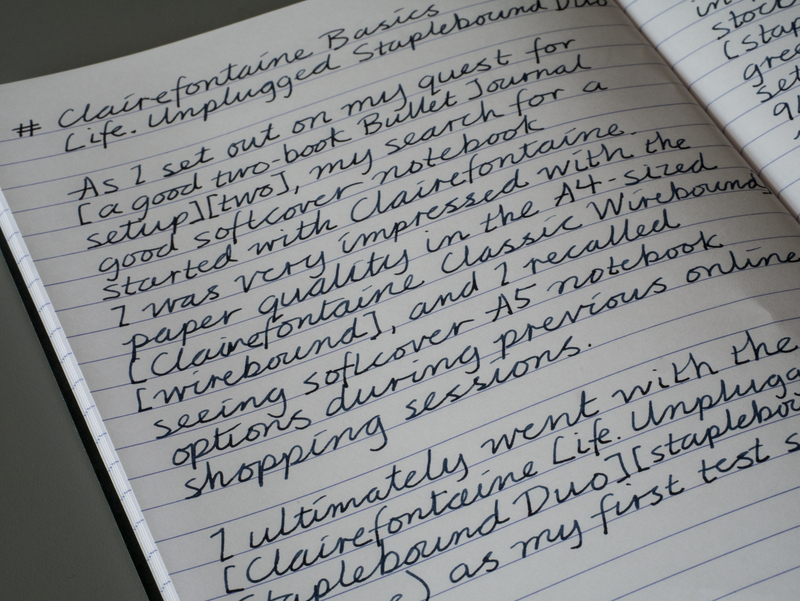 I happily pay $16 per Baron Fig, but moving to a two-book Clairefontaine setup would save me $6.50 per re-up. This isn't exactly apples-to-apples, since the Baron Fig price includes shipping, but this is mitigated by the fact that with me there is always another Goulet purchase to piggyback on to minimize shipping expense. If I find a suitable softcover notebook pair for my two-book setup, I will most likely combine them into a single leather cover. As a result, cover aesthetics and durability aren't as important to me as paper quality and ruling style. That said, I was pleased with the appearance and durability of the Life. Unplugged Staplebound Duo. 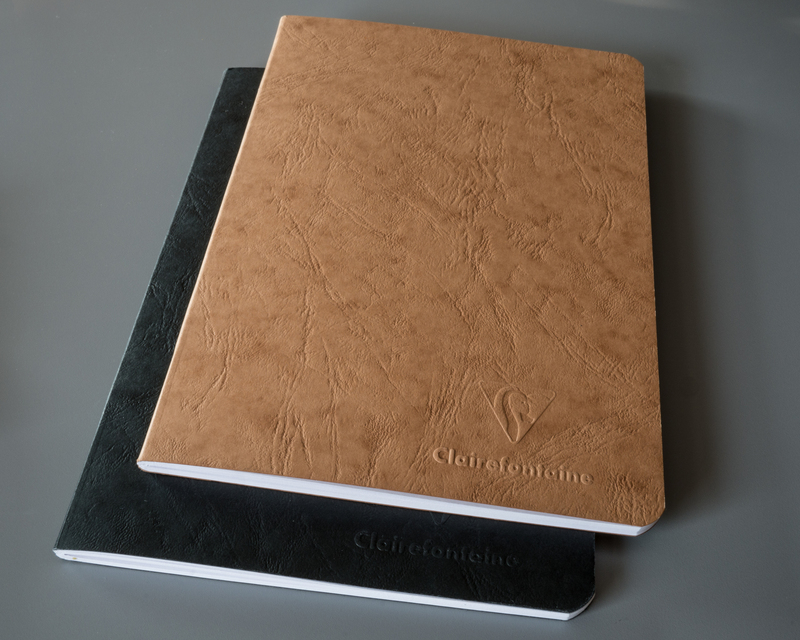 As I noted in my Clairfontaine Classic Wirebound review, I'm not a big fan of the color pattern design that Clairefontaine uses on many of its notebook covers. Fortunately, the Life. Unplugged Staplebound Duo cover has a plain solid color design with subtle texture to it. The cover stock is high quality and does not bend or crease easily. I dragged one of the books along with me on a 10-day trip with plenty of backpack stuffing and shoving, and it came out still looking like new. The paper in the Life. Unplugged Staplebound Duo looks and feels nearly identical (aside from dimensions) to the paper in the Classic Wirebound. In other words, it's pretty great. It has the telltale Clairfontaine smoothness and heft to it. As with the Classic Wirebound, I was hard pressed to find a pen that didn't perform well on it. I did not encounter any feathering or ghosting, even when I threw some of my wetter pens at it. As expected with Clairefontaine paper, the drying time is a bit on the long side, but it was not problematic for me under typical usage conditions. My only real complaint with this notebook is the ruling. I find the 8mm lined ruling to be quite nice for long form writing. However, it doesn't work well for me as a Bullet Journal setup. I like to space things out a bit to make my bullet lists more readable, and skipping a full 8mm line to add some white space looks and feels excessive. The Clairefontaine Life. Unplugged Staplebound Duo is a nice, durable softcover notebook that is a great value if you appreciate high quality paper. 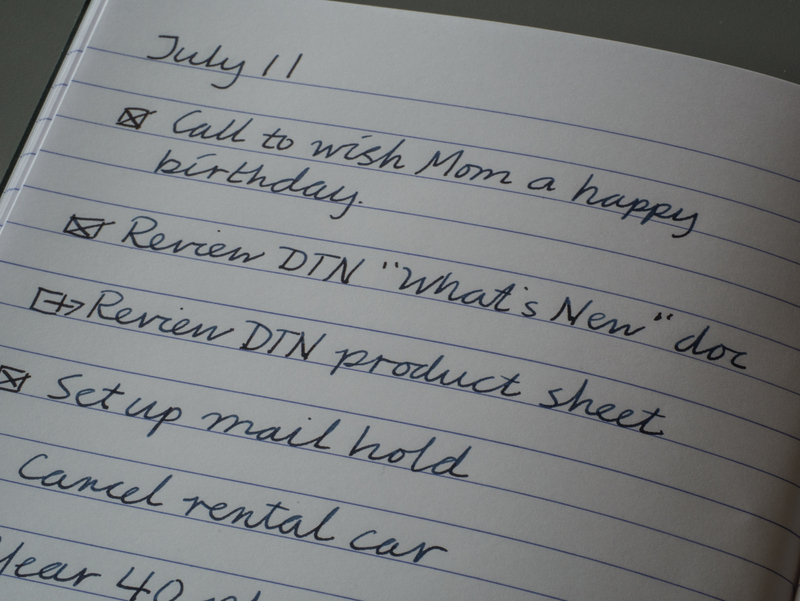 I highly recommend it for traditional journaling and note-taking use cases. Unfortunately, however, I've ruled it out as an option for my two-book Bullet Journal setup due to the paper ruling. As I've mentioned previously, my preference is dot grid. While I am keeping an open mind about using ruled paper, a narrower rule is a must for my Bullet Journal use case.